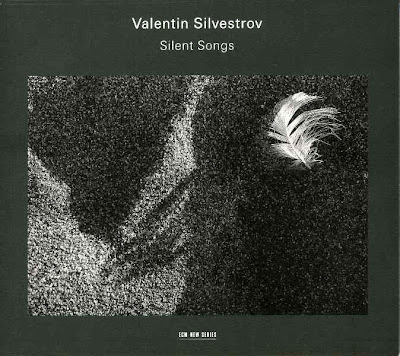 I don't know much about Valentin Silvestrov, the 20th century composer. But based on this incredible collection and his Symphony No. 6, he is really something else. I'm horrible at writing about classical music, you know that. I'll try. What is presented here is 2 discs of music that took place in 1985. Spanning the 2 discs is primarily his four-part song cycle "Silent Songs" in which he composes beautiful music from the texts of famous poets (Keats, Pushkin, etc.). 24 songs in 4 parts for baritone and piano. It's haunting music. The last 4 songs on disc 2 is another single for the same setup. The music drifts, the singer Sergey Yakovenko has this really ethereal voice. It's singing, but not like any singing I've heard. AMG calls it the "closest thing to ambient vocal music there is" and I would have to agree. It's a very interesting concept. Best part of classical cds are the liner notes and explanations that are included, and ECM's New Series is part of this greatness, so I'll just type those out to help explain. In Moscow on March 9, 1985, a special concert took place. Together with Sergey Yakovenko, the outstanding singer and musician, I gave the premiere of Valentin Silvestrov's Silent Songs. Some fragments from the cycle had been presented previously in concerts, but the complete version received its first hearing only on that day. When performing this cycle, the singer and pianist face a challenge that has perhaps never existed on the concert stage. For two hours of very quiet music, without any outward effects or easy "fodder" for the listeners or performers, they not only have to capture the attention of the audience, but to lend expression to the incredible tension of the music, the electrifying contrasts between the very delicate and inwardly trembling and the eruptively explosive episodes of this invariably quiet work. The music itself comes to our aid, allowing the listener to experience the world of the poems as if by magic. I have often read the poems of Silent Songs without the music and discovered, to my astonishment, that for each line of verse the composer has found the only "right" melodic phrase and inflection to express the meaning and mod of the words. As a result, a new substance, a new fuel, infuses the entire piece. The artist's task is to learn to work with this energy, to try to do justice to the music both technically and artistically. The time spent preparing for this recital, the months of intensive and exhausting labour, as well as the concert itself, remains in my memory as one of the happy moments of my artistic life. We may feel we have always known these songs, and in a sense we have. The first hearing will not seem the first, though we will remember it for that slow shock of familiarity, how it awakens memories-those we knew we had, and those we did not. This is part of these songs' silence, that they make no noise of intrusion. We feel we have always known these songs, in part because their musical language is immediately recognizable. It is the language of major-minor harmony (mostly minor) and, more particularly, of the nineteenth-century song with piano. It is a language that belongs, indeed, to former times. Here is what sounds like a folksong arrangement (No. 5). Here are turns of phrase (in No. 8, for example) that Tchaikovsky might have been proud of. Here, in so many piano arpeggios ad even in direct harmonic correspondences, are recollections of Beethoven's Moonlight Sonata, trailing with them the whole history of the nocturne. Here, reappearing again and again, from the third song onwards, is the gently rocking 6/8 rhythm of the berceuse. We are being sung to as we have been sung to before. We are being offered music that will go with us into the darkening. We are being comforted with lullabies. Russian speakers will feel they have always known these songs for the special reason that the poems are among the most familiar in the language. For all of us, what we have always known, beyond the songs, is this voice. Singing almost always at a pianissimo-the marking on each song is sotto voce, and only in the Chorale (No. 21) does the dynamic level rise above the occasional mp-it is a voice that is not declaiming to an audience but singing into our ear. It is the voice of a grandfather, passing on the songs of generations. With it is the piano, its close companion, now slowing a little, now pressing forward, breathing with the voice. "The singing voice should not be at a remove from the piano," the composer notes, "but must proceed as it were from the depth of the piano sound, now emerging, now sinking. It is as if one were hearing singing that is inside itself." And again: "All the songs must be sung very calmly, with a light, transparent, bright sound, restrained in expression, without psychological exaggeration." The singer is not an actor, projecting the balm of Baratynsky or Lermontov, a legend from Keats or Shelley, Pushkin's solitariness or Shevchenko's farewell, the bitterness of Mandelstam or the delight of Tyutchev, the troubled aftermath in Yesenin or the assurance of Zhukovsky. The singer is here not to display emotion but to remind us of these songs we have always known, and of how melancholy and consolation go hand in hand. Yet though we may feel we have always known these songs, we have not. They are new-startlingly new for 1974-1977, when composers in the Soviet Union were stretching boundaries. Heard in the context of other music from this period of official constraint's exhaustion-Sofia Gubaidulina's Offertorium, Alfred Schnittke's First Concerto Grosso, Galina Ustvolskaya's Composition No. 3, Arvo Part's Fratres - these songs make no claims of innovation (another aspect of their silence), in which respect they are indeed innovatory. Just when the stylistic features of Russian Romanticism were no longer being forcibly imposed, here they were, redoubled - and not by a stalwart of state music but by a young avantgardist. Just when composers could at last make big personal statements in public, here was one letting the past express itself, in the private dimensions of whispered song. If we feel we have always known these songs, that is because they speak so much from long ago, because the singer is imparting nothing new. In his quiet retrieval, though, he is making everything new, for what we hear is his remembering. All the songs are slow; they have the pace of reflection and reverberation. They also have the space, the sense of cavernous chamber, be it only the body of the piano, within which we hear as harmony and melody the upper resonances of the extreme bass that is almost always in play. Just as the singer is asked to perform each song sotto voce, so the pianist is requested to keep the una corda pedal down through nearly every number - the single exception being, once more, the Chorale - but the fluctuating use of the sustaining pedal, also marked, keeps the resonances clear and fresh. Each song is the echo of a song, the memory. Do we still feel we have always known these songs? The sotto voce delivery not only gives them an aura of intimacy and inheriting, it also leaves the singer naked, without the support of his training. And with this naked voice he has to cover a range of two octaves - to venture, even if the centre is solidly in a baritone's middle register, into both lower and, in particular, high regions, where the sound is bound to be impure. The resulting hazardous, tenuous communication is there by design. This is fragile music, requiring the utmost delicacy and candour from its performers. How can we then feel we have always known these songs? The singer is placed under strain - freely places himself under strain, to search. Only one melody is immediately found: that of the "Ukrainian folksong". No. 5, a regular tune in a straightforward tonality, D natural minor. (Twenty years later the composer adapted this piece to make the middle movement of his Requiem.) Otherwise melodies stray, and end without finding their way back to the keynote, leaving the piano to complete the return or, more likely, continue the straying, until the music is overtaken by deceleration. For a while the piano rarely provides more than the briefest possible introduction, almost always there is a postlude. So it cannot be that we have always known these songs, for most of them are still emerging, through seemingly improvised delays and changes. Often there are subtle adjustments from verse to verse - and strophic form is the norm. Even No. 5 has this feeling of tentativeness despite certainty, trying different treatments of the same basic motifs. In the postludes such self-exploration is continued to the point of self-dissolve, out of which the next song can begin. And the cycle as a whole has its postlude in the five concluding songs, among which the Chorale - almost symmetrically balancing No. 5 - presents the essential harmonies in crystalline form. For, magically distinct as many of the melodies are, they share fundamental traits, almost as if all were versions of one song. If we have always known these songs, this may be the reason, that we know their source. It is that one song, the song we thought had been lost. Thank you very much. This is a wonderful recording.